Food which gets into your body and which is not right food will bring out of you the rudeness. Food can make you rude. This "protein, protein, protein" that everybody is talking about is just a meat lobby. Too much protein kills you. Protein is the hardest thing to digest, especially if it is more than a reasonable quantity. It makes certain glands work to their death. To be frank with you, cancer is the problem of an over-heavy protein diet. That is, if you want to know about cancer, eat too much protein and you will get cancer whether you like it or not. An alkaline body doesn’t have cancer. It can’ t create it. It is too much acidity which makes you unhealthy. Vegetable protein cannot cause cancer. It cannot, We are talking about meat protein. 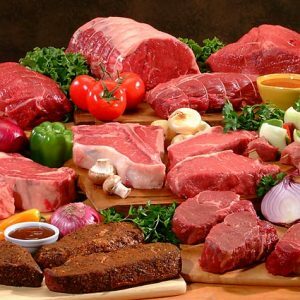 Meat protein is not eliminated from the body within 24 hours. There is no vegetable protein which does not leave the body within 24 hours. This is not a question of whether to eat meat or not. That is not the problem. We are talking about time and digestion. You must not eat food which does not digest or leave your colon within 24 hours. That’s a basic human Law. There is no "yes" to it; there is no "no" to it. Only eat that food which leaves the colon within 24 hours. Do this and you won’t have any problems, To tell how long it takes the body to eliminate a food is very simple. One day eat beets with your meal. You will see the beets in your stool and that will give you the time. It is a simple way to measure. You may ask, "And what about people who get cancer who have never eaten meat?" Well, sometimes it is passed on by heredity. However, consult the affairs of families which are vegetarians, strict vegetarians. They do not even know all these diseases. What should we do? Should we totally close our eyes to this fact? In India, they eat tamarind, rice, lentils and yogurt. They don’t know what fatness is, they don’t know what cancer is, they don’t know what impotence is. They do not go blind. There are diseases with which we are very commonly confronted that they don’t know at all. Their disease is old age. That is their major disease. They don’t know any of these diseases that we find in the United States or in Europe and in some areas of northern India where the people eat meat. Most of India, my God, they don’t know even what we are talking about. If you speak of "cancer" they think you are talking about astrology. They don’t even relate to what we relate to. They are healthy, they live long. Too much protein may cause offensive body odor. If you are a vegetarian and still have offensive body odor, it could mean you are getting too much protein, and too much uric acid is being formed in the body. To relieve this condition, eat only vegetables, cooked for easier digestion, and fast on water 2 days a week. “It makes certain glands work to their death”. “To be frank with you, cancer is the problem of an over-heavy protein diet”. completely unscientific. cause of cancer is not protein though from any source it may. protein is building block of our body. if protien increases beyound certain level you may say “gout can develope” but not cancer. beet is rich in sugar not protein. mushroom, seeds (dal) are rich in protein. its fiber which takes longest time to pass through intestinal tract.and all type of cancer are not hereditary diseases, there can be hereditary predisposition. cancer is largely known to be genetic disorder of uncontrolled cell multiplication. eating meat bears many risk, now a days so is with vegetables also. pesticides sprayed over plants, same plants are fed to animals. in meat bioconcentration of these substances is increased.there many carcinogenic chemicals in the environment are responsible for cancer. after green revolution punjab is an example of increased cancer cases. it all due to changes in DNA of an individual. good reply Singh. All types of food seem to have the same "health risks" nowadays. does fasting on water basically mean eat nothing and drink water all day? Where can I buy this book Ancient Art of Self Healing from? And thank you so much for the seva and work you put into this site. It should have been better if supported by the Gurbani refrences,so this confusion be cleared wether to eat or not. I agree….I am confused about this issue also…does sikhism allow to eat meat or not? what have our gurus said about it and are there any references in Guru Granth Sahib? For those who want references to gurbani please find the following. Feel free to cross reference with http://www.srigranth.org. In this passage, the Guruji says that people who are truly one with God/Waheguru eat only foods made from grain and water, implying that they eat only plants. If the Truest of the True people only eat plants, and not meat, then eating meat must be wrong. This part of the Sri Guru Granth Sahib lists those things which will not bring you any closer to Waheguru. The marijuana refers to taking drugs, fish refers to eating meat, and wine refers to drinking alcohol. People who take illicit drugs, eat meat or drink alcohol will go to hell ( i.e., not merge with Waheguru and have to go through 84 lakh cycles of life and death). The Guruji is saying that killing beings (humans or animals) will in the end not bring you any closer to Waheguru. By saying that if you kill living beings you will suffer terrible pain implies that your karma will be tainted, you will have to go through the life/death cycle and you will not be free from this physical world. Thus, eating meat is wrong (since an animal has to be killed). Sikhism says that Waheguru is in everything (in Kirtan Sohila, Sub Mei Joth, Joth hai Soi: “The light is in everything”; and in Japji Sahib, Hukma undher subko, bahar hukum na koi: “The command of Waheguru is in everything, there is no other command.”). So, if Waheguru is in everything, if Waheguru loves every single little thing, why take its life away? Thus, killing even an inconsequential hen is wrong. So obviously, eating meat is wrong. Guruji quite bluntly states that eating of meat is forbidden. No matter if you think it “tastes” good or people “claim” it to be healthy (which in fact it is not) you need to control your urge to eat meat, or else you will end up in hell. The part of the worl that eats meat are just greedy, greedy for the so called taste, for the pleasure of taking something that is forbidden. These type of people neglect the real Truth of the world. In this passage the virtues of Waheguru are being extolled. The Guruji says that when Waheguru has you in his favor you will surely be saved. The cat won’t eat a mouse/meat, a butcher won’t kill animals, and nets holding fish will break, thus freeing the fish to live. This means that whatever Waheguru loves in this world, he will free it from pain. The catch is, Waheguru loves everything in the world, thus Waheguru wants to free everything from being needlessly killed or pained. When humans kill animals merely to eat, they are needlessly killing animals since humans do not need meat to survive. Thus, eating meat is wrong. This is a very simple passage. Guruji is saying that eating a vegetarian diet is the best. The Guruji says that there is no animal that is going to be willing to give up its life, to be killed, just so a greedy human can eat its meat, which the human doesn’t even need to survive. Thanks Harmeet, for bringing the truth before people. There are many more hymns in Guru Granth Sahib, telling us not to consume non veg. We are lacking behind in understanding the message of True Guru and fallen in so called stories of Guru in support of eating meat. Any one who chants the name of God, associates the company of holy and contemplates Him in meditation, understands well what to do and what not to. Sir Sanford Flemming surveyed Canada for the railway in the 1800's and he wrote about it in a journal. He stated when they got to the foothills of the Rocky mountains–they were walking–, they switched from their traditional diet to a diet of 50% meat and 50% fat. The food is called pemmican (dried buffalo or moose or elk meat) and north american indians have lived off it for eons. Probably cancer free :) Flemming recorded the incredible health benefits they received from eating their new food. He said their bodies had become leaner and stronger; they had more energy than before; and Flemming said that he was surprised at the transformation their bodies had gone through. And if that is not enough, then look at the food in the shopping cart of an obeese person next time your in a gracery store. ALL CARBS BABY!!!!!!!!!!!!!! !